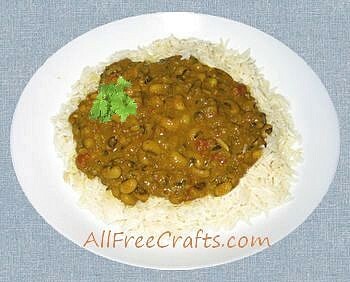 Black-eyed peas, also known as black-eyed beans, are the mainstay in this new jar mix recipe for a delicious vegetarian curry. Served with rice, it makes an appetizing mid-week meal for four. Place peas in a 2 cup (1 pint) mason jar. Place all spices and seasonings in a small plastic bag. 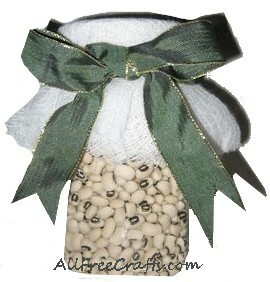 Seal the bag and add to the jar, placing the bag on top of the black-eyed peas. Screw on the jar lid and decorate the jar as desired. You will need to include cooking directions if you are giving this jar mix as a gift. 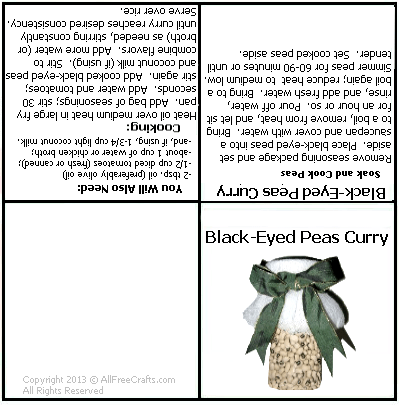 Print the Black-Eyed Curry Mix label, or write your own version of the instructions shown below. Tie the instructions label to your jar mix with string or a pretty ribbon. Remove seasoning package and set aside. Place black-eyed peas into a saucepan and cover with water. Bring to a boil, remove from heat, and let site for an hour or so. Pour off water, rinse, and add fresh water. Bring to a boil again; reduce heat to medium-low. Simmer peas for 60-90 minutes or until tender. Set cooked peas aside. Heat oil over medium heat in large fry pan. Add bag of seasonings; stir 30 seconds. Add water and tomatoes; stir again. Add cooked black-eyed peas and coconut milk (if using). Stir to combine flavors. Add more water (or chicken broth) as needed, stirring constantly until curry reaches desired consistency. Serve over rice. Fold cheesecloth into four layers, then cut a six inch circle through all layers. Place the circle on top of the jar and fasten around the neck of the jar with a rubber band. If you are using the printable label, cut out and fold the label into quarters, so that the jar image appears on the front, the directions are in the middle two pages, and the copyright is on the back. Punch a small hole into the upper left corner of the label. Run a string or narrow length of ribbon through the hole punched in the label. Tie the label to the neck of the jar. Cover the rubber band with a wide ribbon. Knot the ribbon to keep it in place, then form the ribbon into a luxuriant bow. Voila! One jar of Black Eyed Peas Curry Jar Mix for an easy, tasty supper.